Fuse Box - 78 or 79? 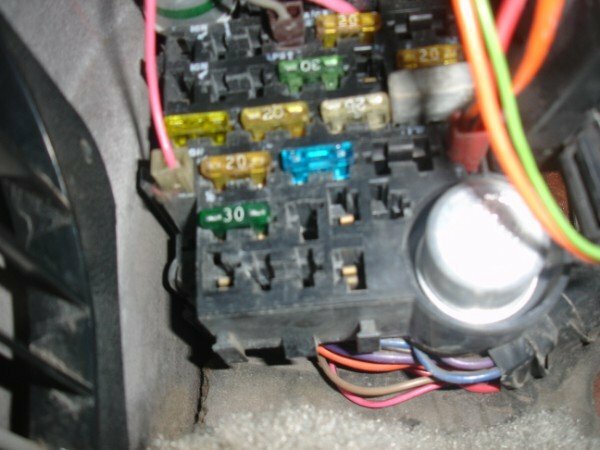 I've recently repaired the wipers on my 78 Corvette and in discussing this with some UK freinds a question has arisen re the fuse box on their cars. The picture is from one of theirs. It's not like the one in my car, (which is as the pictures in the 78 Electrical Trouble-shooting Manual)so I'm wondering if they actually have 79s! 78 was the last year for the glass "littlefuses". 79 and newer had the plastic spade fuses like in your picture. I'll pass that info on. where is the fuse box located on the 78? Last edited by rihwoods; 04-13-2008 at 11:57 PM. Hey, that looks just like my mess. By the way, the insert into the wiper fuse switch is not a bubba, that is correct for the 78. By the way Rich - you have the same issue with the brown inline fuse holder that I have, if you notice, one of the hot leads is exposed and sticking out of the fuse holder (at the top). I ran across this while searching for a retrofit blade type fuse center for my '78 other than those universal aftermarket types. Guess I never stuck my head under the dash of a '79, as I was not aware the blade type fuse panel had apparently become adopted as early as that year. My question is, has anyone retrofitted a '78 with this? I'm guessing, based on the plethora of posts and issues with wipers, that this is a common issue? I too have relegated myself to the endless....sleepless....grief filled nights of checking fuses, wiring diagrams, plugging and unplugging connections...scouring the internet...testing ground and hot wires....wondering "what the hell is THIS wire for?? "....and of course brushing up on my sordid "non-kid-friendly" wiring vocabulary. And of course chasing wires off into the never-never, where you can't see where they go...what they do....or why THIS one is unplugged?! Oooh! Oooh! And let us not forget the fuse blocks that apparently had the words written on them with crayon or some other non-time friendly substance. Actually, I think crayon would have lasted longer! Wiring will be the death of me, I swear. Quick Reply: Fuse Box - 78 or 79?